Spring is around the corner, and the White Tuna belly salad sent by Antonio has everything to welcome this beautiful season: an apple "clover", tomato "flowers", colors... and above all, a lot of flavor! Peel the apples, cut them into slices, remove the center, and sear them in the pan on both sides with a little olive oil, until golden but without breaking them. Sear the cheese in the pan, just like the apples. Place three slices of apple on the plate in the shape of a clover. Place the cheese in the center, on top of the apple slices. Complete the dish with lamb's lettuce, lettuce, corn and asparagus. Add the previously roasted walnuts and pine nuts, and some White Tuna belly fillets (set aside the fish oil). Add the cherry tomatoes, cut into a flower shape. 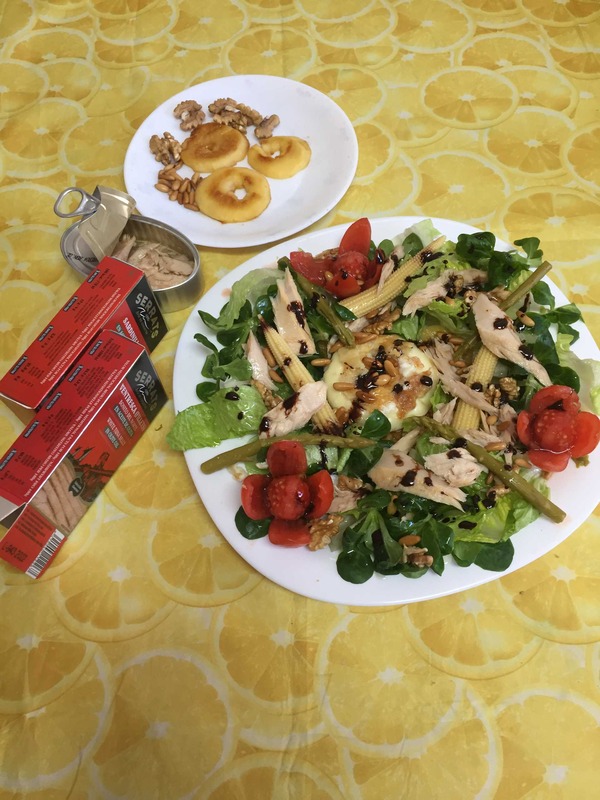 Dress everything with the White Tuna oil and a little reduction of Forum red vinegar, and enjoy this unique salad! The perfect spring salad. Thanks Antonio! If you like this recipe, you can prepare it at home with the white tuna belly available at our online store.